Critical illness Cover insurance can be added to a traditional life insurance policy or purchased as a separate item – the objective being that if the policy holder becomes ill from predominantly life threatening conditions a lump sum is paid out to offset the inconvenience of the incapacity; in most life insurances this is 27 to 34 major conditions. Serious illness cover from some insurers is very similar but often covers more conditions and pays out based on the severity of the condition, and will pay out more than once even for repetitive conditions. With nearly 4 x more conditions covered by serious illness cover from some UK insurers, an accident all the way to a major illness would prompt a payout. In the present financial climate nearly any incapacity no matter how severe would affect the ability to earn and depending on condition would bring additional costs of healthcare and lifestyle changes. So those who need this cover most would be anyone at potential financial risk should they not have sufficient savings in the event of being unable to work short or longer term. By selecting serious illness cover rather than a traditional critical illness cover life insurance product the policyholder can spread their risk over far more debilitating conditions. You don't want to imagine being diagnosed with a critical illness, but you need to keep in mind that if you are you may not recover financially. More people are surviving after being diagnosed with a serious illness. However many sufferers are not able to come back to work for a lengthy time after surviving. 1 in 3 Britons will be diagnosed with cancer at some point in their life according to the imperial cancer research fund. The odds are good that one day you may have a critical illness. You may scoff now and say no, not me. However, the statistics show that yes, maybe it's you. Do you want to be helpless when the worst happens? No, I don't either, that's why you should seriously consider critical illness cover. Just in case things don't go your way, you will have something there to protect you. Whatever you need the money for it will be there for you. Instead of being caught up, and stuck with an increasing pile of bills to pay, with no means or hope of paying them. What Types Of Disease Do Critical Illness Plans Cover? The coverage offered in a critical insurance plan varies depending on the provider and policy you choose. There are many diseases offered from an average of 25 illnesses up to 161 covered. However you should not necessarily go for the widest level of coverage because you may be paying above the odds for extremely rare diseases. It helps if you look at your occupation, family history, and potential risks when trying to determine the right coverage for you. Understanding where you are most likely to experience a severe illness will enable you to ensure you are fully covered for your risks, without getting unnecessary coverage that adds to your monthly bill. There are seven major categories that make up the coverage in a critical insurance package: Cancer, heart attacks, strokes, multiple sclerosis, coronary artery bypass, kidney failure, and major organ transplants. 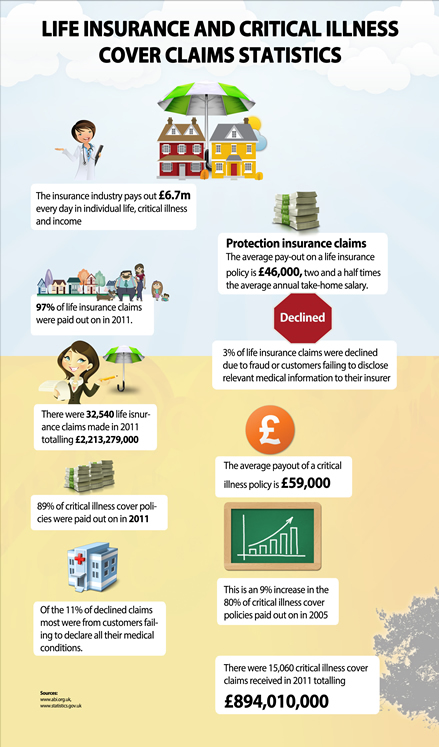 These seven major categories are the foundation of all the critical illness cover in Britain. Most of the average 25 illnesses covered by the plans are offshoots or somehow related to those seven key categories. It's important that you understand that in case there are specific diseases you were concerned about. If so, you should check your insurance policy to make sure you are covered. It's important you remember that this type of insurance is designed for serious illnesses only. It is not meant to protect you against mild conditions and many policies will not pay out if you have the condition in the policy, but it is lacking in severity. However there are some policies that pay out based on severity, with less severe forms of the illness paying out smaller settlements. You need to check what your plan policy states. If you work in an area where you may experience a milder form of a critical illness that would still severely impact your ability to work, you should seriously consider getting a policy that pays out based on the severity of the illness. You need to read through the definitions outlined in your policy to see what illnesses you are protected for. These definitions will ultimately determine whether or not you are paid out, in the event that you are diagnosed with a serious illness. It is very important that you are clear about the definitions of the illnesses. The definitions of illnesses for your critical illness protection have been defined by the insurance association, you can read their definitions and compare it with your plans to find any discrepancies. If you currently have life assurance or are considering getting it, you can add on critical illness to your life assurance policy for an extra premium. This means that you get your life assurance payout upon death or on diagnosis of a critical illness. However you should be careful because if you file a claim for critical illness with your life assurance policy, your policy is paid out and you no longer have life assurance in the event you die. However, there are buy back options available to life assurance holders that enable you to reinstate your death benefit with the plan as well as buy back insurance in case your partner will have a serious illness. This is a serious consideration to think about if you hold a joint policy for critical illness. It's essential that you provide all the facts when you are making your application because your claim can be refused in the event you haven't provided all the facts or have lied on your application. That means dot all your i's and cross all your t's. Leaving out a vital piece of information may be grounds to refuse you for hundreds of pounds should your application have missing information. You are going to be paying for this plan, ensure that it is going to protect you when you need it. If you are unsure about something on the application, just ask your agent. One advantage you should remember is that your critical life insurance payouts are tax free. So everything you get paid out is above board and wont get eaten up by the tax man. You need to be aware in the event that you are diagnosed with a critical illness that you must survive for between 14 to 30 days before being paid out. In the event of a disability application it could take up to 6 months to process your claim. You should read your policy and how long you must survive for before your plan pays you out. You will need to survive on your own financially until you reach the designated time period, so take that into consideration when selecting a policy. You can also get your salary protected and get a payout based on a multiplication of your salary up to 500,000 pounds. You may also be able to get your employer to provide this coverage for you, this coverage offers employers tax reliefs. Talk to your employer about the possibility of critical illness cover if you are working in a dangerous environment or your profession would warrant the insurance. They can use it as a tax write-off anyways and it would help their employees who get seriously injured on the job. You critical illness policy will be based upon your risks and the circumstances surrounding your application. For example you will have a different price if you are working in a dangerous field, or if you have a family history of disease. You can often get instant quotes for critical illness cover, so shop around to find the right policy for you. If you have children then you should check for insurers that offer free illness cover for your children when you have coverage for you and your spouse. Regardless of which insurer you are considering working with, all critical insurance providers can be found in the Association of British Insurers. This organization helps to ensure a high standard of quality amongst insurers and defines the illnesses you will be protected against. It prevents your insurer from playing games with you or trying to give you the run around. Should You Take A Stand Alone Cover Or Add On To Life Assurance? You can get a wide range of critical illness premiums designed for your needs. Some popular packages are those that protect your mortgage and income. You can often get Alzheimer's and Parkinson's covered in critical illness cover. Take care when choosing how you will get your critical illness protection because sometimes two separate policies can be more advantageous than adding on to your life assurance policy. You need to look at if you would be financially burdened should you become ill with a serious form of illness. Look at your mortgage and if you would be able to continue making your payments. If not then the good news is that you can apply for this plans protection if you are between 18 to 69 years old. Better yet you can cover up to 161 illnesses with a critical illness policy. Some of the most compelling reasons for a critical illness cover are that you do not need to worry about returning to work if you have a serious illness. You will not be worried about the mortgage and can use your payout to cover anything you wish. You can also consider getting income protection which replaces your income in the event of an accident or illness. You are 400% more likely to get a serious illness than you are to die before you are 65. That means if and when you do get a critical illness you will be financially affected. The only question is do you want to have that protection in place, or are you prepared to stick it out on your own? The constantly improving medical technology available means you are more, and more likely to survive in the event of being diagnosed with a critical illness. In the past getting a critical illness meant death, now with more and more people living they are needing to address the serious financial concerns involved in the aftermath of a serious illness. 1 in 3 Britons will be diagnosed with cancer at some point in their lives. You have a one in three chance in acquiring this serious illness, would you rather survive it by yourself or have something there to help you when you need it most? Critical illness cover is a great way to provide a safety net when you are faced with an unthinkable illness. Look at the options available and get yourself a free quick quote. Go over the definitions, and diseases that are in your cover. If you have life assurance, compare adding on critical illness cover with getting a stand-alone policy. Think about what you should add on to your cover and what you will need most. Take a look at the options available to you, think about what your biggest risks are, and get a cover that fits your needs.